While we can always retreat from rising sea levels, it’s more difficult to run away from food scarcity. A recent study by Kansas State University concludes that a temperature rise of 1 degree Celsius leads to a 20% decline in wheat production. And expected advances in genetic modification will not come close to covering the gap. We are projected to raise the temperature of the planet by one to three degrees Celsius over the next thirty years. The United States produces about $18 billion of wheat each year, and about 50% of our wheat is exported. 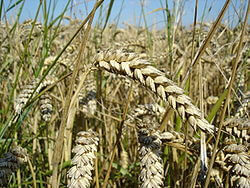 A 20% decline in wheat production equates to $3.6 billion annually. Polluting technologies that increase our global temperature do not have to pay for the economic damage that they unleash on our planet. A prudent economic approach would factor in the costs of polluting. Instead, the opposite is true: fossil fuels continue to be subsidized in vast quantities. The bottom line: Coal and natural gas raise our global temperature and destroy our agricultural output, to the tune of billions of dollars annually. Fuel-free sources of electricity, namely wind and solar power, emit zero greenhouse gases, and preserve agricultural output.